While the major fast food companies have added salads to their menus, and volunteer their fat and calorie counts, this doesn’t mean that their hamburgers, tacos, and pizzas have come a long way nutritionally. A new study has shown that the calorie count of fast food meals hasn’t really changed in quite a while. The study used data from a food and nutrient database that compiled data focusing on meals from McDonald’s, Burger King, Wendy’s, Taco Bell, KFC, Arby’s, Jack in the Box, and Dairy Queen. All had been in the database since 1997. Despite such additional menu options as smoothies, apple slices, oatmeal, and grilled chicken, the average calorie counts within these eight major outlets changed little from 1997 through 2010. PLUS: A weird way to fix fast food. The study noted a sharp increase in the variety of fast food. The researchers found a 53% spike in the number of menu items across the restaurants. It rose to 1,036 from 679. Salads rose to 51 from 11, and sweetened teas to 35 from zero. In terms of entrees and beverages, there was no significant change in calories. Desserts and condiments showed gradual increases. Side items did have a reasonable drop in calorie counts, probably reflecting the rise in the number of salads offered. In 2009 and 2010, the average lunch or dinner entree weighed in at 453 calories. The average side was 263. But, it’s important to keep in mind with fast food—and eating out in general—that calories add up fast. Dressings, sweet drinks, and additions like a slice of cheese on your burger can all raise the count significantly. Of course, to maintain a healthy diet, eating fast food should be done in moderation, if at all. There is no shortage of studies that have linked fast food intake to weight gain. That reflects poorly on the fact that 80% of American adults eat fast food at least once every month, and 28% at least twice a week. Calories are the key to managing your weight. Burn more than you take in each day, and you will lose weight, slowly but definitively. Of course, the only way to do that is to eat an appropriate amount of nutritious food, and to exercise. But, there are healthy ways to help the process through the use of supplements and food choices that can help spark your metabolism. Bauer, K., et al., “Energy Content of U.S. 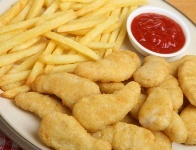 Fast-Food Restaurant Offerings: 14-Year Trends.” American Journal of Preventive Medicine November 2012; 43: 490-497.